Iceland is a mountainous island country straddling Europe and North America in the north Atlantic Ocean. Once upon a time, people rarely visited the Nordic region expecting it to be a frosty, icebound nation. They couldn't have been more wrong. 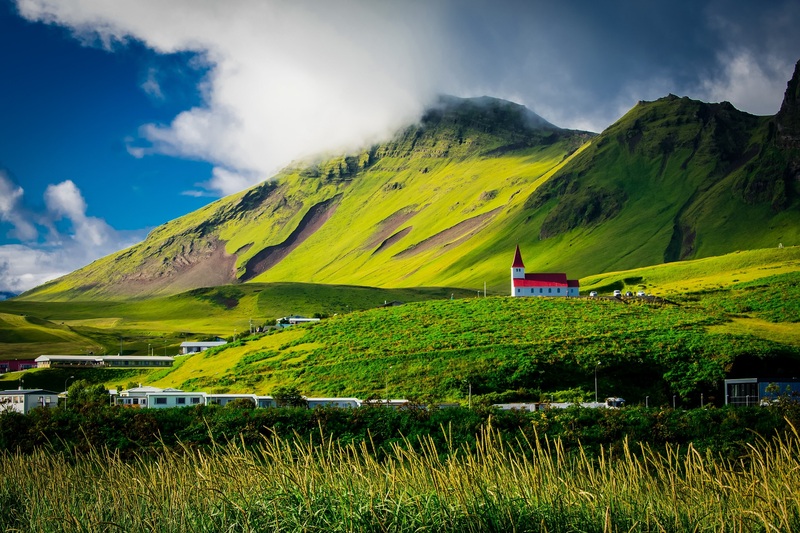 Greener than Greenland with a mild and pleasant maritime climate, Iceland is now the most bucket-listed destination. It doesn't hurt that it is utterly Instagram-worthy thanks to its strange and secluded sites. Referred to as the closest thing to the moon on Earth, Iceland dazzles visitors with its lunar landscapes, glimpses of Aurora Borealis, simmering volcanoes, black beaches, underground ice caves, acidic mud pools, spouting geysers, and towering glaciers. When you come to Iceland, give yourself at least 10 days to explore the beautiful country. Let’s begin! Compared to millions of visitors flocking to Iceland annually, the tiny country had a relatively small population of approximately 348,580 people. The large proportion of tourists can be irksome to Icelanders as they are an extremely eco-friendly nation. It is important for travelers to understand and respect the local culture and customs. The Icelanders are particularly fond of poetry and are renowned for their sagas and eddas all over the world. The Icelandic language has its roots in Old Norse, a North Germanic language. English and Danish are also taught in schools, but loanwords and anglicism are avoided. Outdoor activities and sports are the most popular form of recreation among children and adults alike. Some of the popular sports include football, athletics, handball, basketball, golf, tennis, swimming, and horseback riding. Icelanders also love to play chess, and you will find plenty of chess clubs all over the country. Iceland is divided into several regions; and each region is blessed with unique and desolate lands. Southwest Iceland is where the most of the Iceland's population resides. The capital of Iceland, Reykjavík, is also within the Southwest. It harbors young lavas that are stunningly beautiful and akin to the moon and Mars. Blue Lagoon is a popular tourist destination boasting geothermal spas that stay warm even during harsh winters. Rugged, grass-blanketed cliffs and black lava-crusted beaches are commonly found here. Hafnaberg Cliffs and Krýsuvík Cliffs offer dramatic panoramas of the ocean, wave-beaten shores, and birds. It happens that Southwest is one of the least flocked sites as well, which is rather a shame as it is quite spectacular. At West Fjords, the beauty of Iceland reaches its climax. Imagine a landscape of rugged pathways and pitted dirt roads meandering among steep mountains with hardly any humans around. As you gaze at the peninsula's craggy coastlines and oceans, you wonder why it is so remote. Then again, it is a plus for those who love quiet places. Affectionately known as 'Little Iceland', West Iceland offers a whole of Iceland with its diverse range of landscapes and experiences. Visit Hellnar and Arnarstapi, quaint small towns, and walk through the lava fields surrounded by awe inspiring glaciers and ragged cliffs. At Snaefellness, experience the exhilarating joy of horseback riding on the beach. Try to discover the numerous islands of Breiðafjörður, and hike West Iceland's many mountains. Here you will stumble upon cascading waterfalls, the striking Northern Lights, and whales. Add Dettifoss to your list - the biggest and most powerful waterfalls in Europe, and if you can't have enough of waterfalls, which you won't, check out Goðafoss. Go on a puffin cruise and whale watching tour at Húsavík and Dalvík. Observe the magnificent and immensely unique natural ice sculptures at Lofthellir Lava Cave. Explore the ancient and bizarre landscape Dimmuborgir dotted with arches, caves, bridges, and lava towers. Austurland is all about narrow fjords, waterfalls, charming fishing villages and jagged coastlines. It is sparsely populated with a very low tourism rate. However, don't underestimate its compelling beauty. The historically rich place has ancient ruins, flourishing wildlife, lakes and calderas. In East Iceland, you must visit Víti Crater Lake, Lagarfljót, a lake said to be a home of a serpent-like creature known as Lagarfljótsormurinn, and Hallormsstaðaskógur National Forest. If you are lucky, you might catch a glimpse of an Arctic Fox! South Iceland is an amalgamation of tumbling waterfalls, massive glaciers, rare geology, and a rich history. Walk behind the stunning waterfall of Seljalandsfoss, traverse the cliffs and discover brooks and streams running through. Visit Reynisfjara beach where you will find unique black sand beaches made with volcanic remains. Watch the Strokkur Geysir erupt spectacularly after every five minutes and follow the river along the mountains. The Highlands of Iceland is a snow-covered region which can only be crossed during the summertime. The sparsely inhabited plateau is a volcanic desert with only a couple of oases where astronauts come to train! The wild territory is punctuated with steep mountains, humongous glaciers, rippling rivers, green-clad meadows, steamy valleys, and geothermal sites. Consisting of mostly lamb, dairy, and fish, Icelandic cuisine is endowed with a rich history. It is also one of those rare places where whale meat is easily available for tourists. On your Icelandic retreat, indulge in harðfiskur, a scrumptious snack made of dried fish pieces usually eaten with butter and coleslaw. Have skyr, a cultured dairy product similar to yogurt, with creamy consistency and mild flavor. If you have never eaten sheep or lamb, do try hangikjöt (smoked lamb) and Slátur (offal sausage). Another thing you must experience rÞorramatur - a traditional midwinter buffet that includes cured meat and fish items. Compared to European and North American countries, alcoholic beverages are pretty expensive here. Cheaper prices can be found at duty-free stores. Reykjavík, the feisty capital of Iceland, is the go-to place if you want to experience the thrill of Iceland's nightlife. Besides wines and beers, plenty of coffee bars and cafes line the street. Icelanders love musical festivals, and on your trip, you must attend at least a couple of them. Due to ever-rising mass tourism, the Nordic island has a wide range of accommodations suitable for all sorts of budgets. Hotels and guesthouses are ideal for couples and families. For students, hostels are more practical. Camping sites and mountain huts are also available which are a great choice for hikers, trekkers, and outdoorsy travelers. High season lasts from June to August when the sun never sets, and the highlands are accessible. It is also the busiest and most expensive time to visit. The months of May and September offers better prices, and a slightly colder climate. The low seasons occurs from October till April. The endless nights deter most of the crowd, but it is the best time to view the Northern Lights. Observe the breathtakingly beautiful Northern Lights in someplace secluded, far away from the busy city streets during winters. Visit the Blue Lagoon to gaze at the beauty of the geothermal spa and understand its popularity. Put on your best mountain gear and hike the lava rocks. Go snowmobiling and whitewater rafting. Don't miss the opportunity to view the whales at Reykjavik and Husavik. The main international airport is Keflavík International Airport located southwest of Reykjavík. For domestic flights, Reykjavík Domestic Airport is the most commonly used airport. Many budget carriers are now offering international and domestic flights to Iceland including WOW Air, Icelandair and Eagle Air. You can also travel to Iceland via boat, through Smyril Line which operates weekly, but it is costly. Traveling within Iceland is fairly easy. Rental cars, public buses and bicycles are the most common methods. Hitchhiking is also widely practiced here. The local currency of Iceland is the Icelandic króna (ISK). Credit cards are widely used here, and cash is almost obsolete. ATMs are found everywhere.